Play the Traditional Irish Bagpipes on your iPad! Uilleann is an extremely authentic sounding set of Traditional Irish bagpipes that is played like the real instrument. 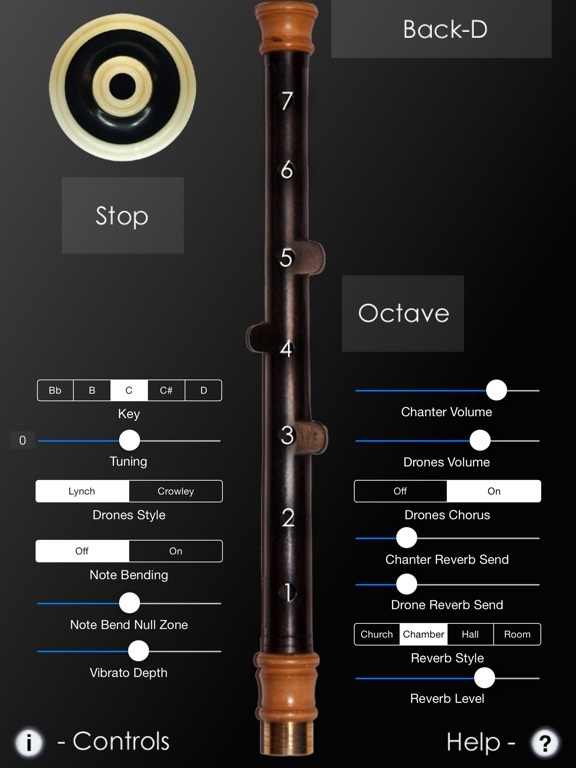 The app emulates the three drones and chanter of a half set of Uilleann pipes. It plays in all the traditional keys of D, C#, C, B, and Bb, and is fully tuneable as much as +/- 50 cents. The Uilleann pipes are a bellows driven set of bagpipes with a two octave range. They are most commonly used for playing traditional Irish dance music and slow airs. In recent years they have been made popular by shows such as Riverdance, as well as many motion picture soundtracks such as "Waking Ned Devine", "Titanic", and "Braveheart". The chanter fingerings are based on those used for the Uilleann pipes and will also be immediately familiar and intuitive for players of the tin whistle and Irish Flute. Uilleann supports traditional finger vibrato, and note bending effects. 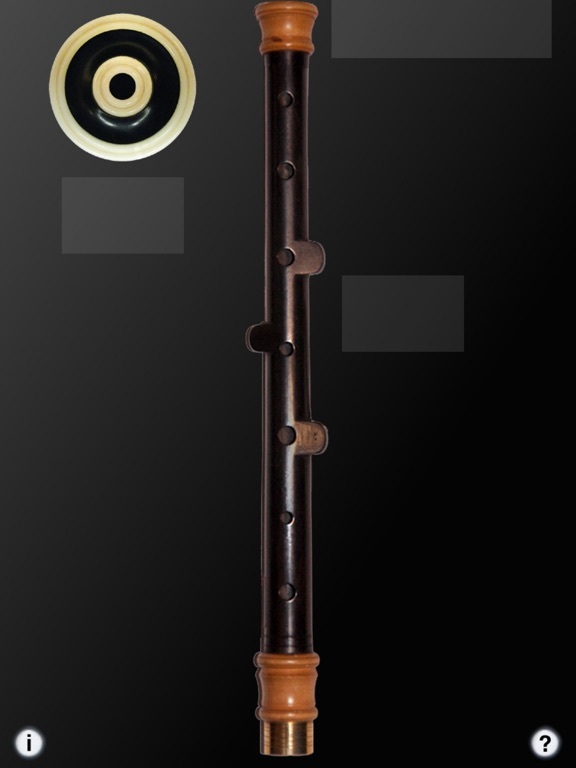 The chanter fingerings are essentially identical to the actual instrument. IMPORTANT: Since this app requires as many as 9 fingers on the screen at the same time, before playing, disable "Multitasking Gestures" on your iPad (in the Settings app, under the General section, turn the Multitasking Gestures switch to the off position). Touch the "?" to turn on the control and note labels. Select your instrument key from the key selector and adjust the fine tuning with the tuning slider. The number to the left of the tuning shows shows the tuning offset in cents. To reset the tuning to zero, just touch the number. Start/stop the drones playing by touching the drone puck. To play the chanter, touch the "Back-D" bar at the top left with your left thumb. This bar is the "Back-D" hole on the back of a real chanter and must be covered for the lower notes to play. Next, touch the top three holes of the chanter starting with the tips of your left index, middle, and ring fingers. Finally, touch the bottom four holes of the chanter with the tips of your right index, middle, ring, and little fingers. Touch the grey "Octave" block next to the chanter with your left little finger to play the notes one octave higher. Touch the grey "Stop" block under the drone with your right thumb to stop the chanter sound while covering all the other holes to perform traditional closed piping techniques. This button represents the bottom of the chanter, which is closed when down on the leg. Touch the "i" to bring up the volume and reverb controls. All values are saved for next time the app is run. Optional finger vibrato may be done by touching holes below the main closed holes used for a note. Set the depth of the vibrato with the "Vibrato Depth" slider. Optional upward note bending is done by sliding the finger right or left very slightly from the root tone hole. The sensitivity to pitch be set using the "Note Bend Null Zone" slider. Sound is based on high quality per-note chanter and drone recordings from my personal concert pitch set of Uilleann pipes. Chanter image based on my Kirk Lynch concert pitch chanter. Drone puck image courtesy of Mike DeSmidt. Crowley drone sample courtesy of Vinnie Kilduff.